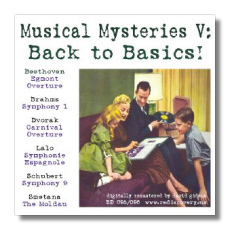 Classical Net Review - Musical Mysteries V - Back To Basics! Middle-aged or older readers might remember The Basic Library of the World's Greatest Music, an inexpensive series of 24 classical music LPs, sold in local grocery stores (!) like cookware, with a new title available each week. (The records came in moss green boxes with gold trim.) Longer musical works were sneakily split across more than one record, thereby encouraging one to buy the following week's record. The boxes contained decent annotations about the music, but one looked in vain for the names of the performers – thus ReDiscovery's "Musical Mysteries" moniker. Since that time, we have been made to believe that these records were junk. How could they be otherwise, with their giveaway prices and anonymous performers? As our parents and grandparents moved or passed away, The Basic Library ended up at library sales, or even in the dump. ReDiscovery has issued several CDs devoted to recordings from The Basic Library – also reviewed by me on Classical.net. Guess what? The music-making on these sets, while sometimes rough and ready, is consistently enjoyable. Furthermore, several of the performers, now that they have been identified, turn out to be musicians for whom LP collectors will spend a lot of money – names such as pianist Noel Mewton-Wood, and (on this pair of CDs) violinist Riccardo Odnoposoff. The musicians heard here were stalwarts of The Basic Library. The most attractive recordings in this release are those of the shorter works. Swoboda's affectionate Carnival Overture leaves no doubt in the listener's mind that this is a rural celebration – there's no false sophistication here, and the conductor (a pupil of Talich, it turns out) makes sure that everyone has a grand time. Hupperts, a Dutch conductor, takes a similarly generous (and expansive) view of The Moldau. Other conductors have painted this work's individual episodes more vividly, but Hupperts hears the music as one grand sweep, as inexorable as the flowing of the river itself. Goehr's first-class Egmont is haughty and militant, which is as it should be, and the Netherlands Philharmonic does itself proud with alert, committed playing. The Schubert and Brahms performances are traditional in spirit and professional in execution. Neumark's blistering Death and Transfiguration is a highlight of "Musical Mysteries IV" (RD 110/111/112/113, reviewed elsewhere). In Schubert's "Great" C-major Symphony, he is less heaven-storming, but the first and third movements are muscular – macho Schubert! – and the only disappointment is that he does not make the finale into the emotionally and structurally culminating experience that it can be. Bamberger's Brahms First is more Bruno Walter than Arturo Toscanini, but the Frankfurt Opera Orchestra is neither the New York Philharmonic nor the NBC Symphony Orchestra, so allowances must be made. This is a thick (but not gooey) and middle-European performance of the work, and is wholly likeable within those parameters. It's just that too many great recordings of this symphony dwell in most of our inner ears. In the Lalo, Odnoposoff and Goehr adhere to the era's practice of omitting the central Intermezzo – even Heifetz did it in his recording from 1951. The problem is that while Odnoposoff's playing is fluid and suave, he in no way reveals the temperament I expect in this piece – for example, in the stamping rhythms in the first movement. On the other hand, if you want a Symphonie espagñole in which the Spanish clichés are played down, this one might be for you. The Brahms and the Smetana come from reel tape masters and are in genuine stereo. The remaining items presumably have been transferred from good copies of the monaural LPs. ReDiscovery's David Gideon always does a fine job of bringing the surface noise as low as possible without impinging on the music. Having said that, the Schubert rides on a noticeable carpet of LP noise. I found it strangely calming, but I did grow up in the LP era, after all. All in all, the sound will not prevent anyone from enjoying these performances. Is it just nostalgia that makes these "Musical Mysteries" so appealing? If I like the music, I can enjoy a good performance almost as much as a great one, and even good ones might make me think about the music in a way I have not before. Also, it is interesting to remember a time in the United States when a basic knowledge of classical music was thought to be part of a "good" education, and it is comforting to know that those who ventured no further into classical music than some records that they brought home from a grocery store still were getting a respectable introduction. Who is blowing the horn for classical music today? Most of the time it isn't even paid lip service. As with other ReDiscovery issues, these are no-frills CD-Rs, although the inlay card contains the briefest biographies of the musicians. The $15 price (for two CDs) includes shipping and handling. ReDiscovery CDs can be purchased from their website: www.rediscovery.us.